The Fellowes Powershred M-8C is intended for moderate home use and will cross-shred paper into 4 x 50mm particles, giving it a P-3 security rating (suitable for the shredding of confidential material). 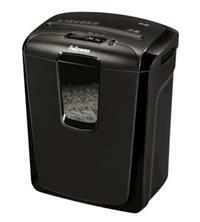 The shredder will handle up to 8 sheets of paper at a time and will also shred staples, paper clips and credit cards. The 15 litre bin has a lift off head and the shredder also comes with features such as a safety lock to disable the shredder when required, a reverse function to help clear any paper jams – and an overheat indicator to let you know the shredder needs to cool down. The shredder can be operated continuously for 5 minutes before it needs a 30-minute cool down period. It is recommended to oil the shredder every time you empty the bin and this can be done with Fellowes Shredder Oil, product code 35250. Warranty on the Fellowes Powershred M-8C Cross-Cut Shredder is 2 years for the machine and 3 years for the cutting blades.